Mizoram Wins first-ever Santosh Trophy title, beat Railways 3-0 in final! A bunch of unheralded diminutive footballers took the Santosh Trophy by storm and maintained their brand of fast-paced attacking football in the Final to deservingly win their maiden Nationals crown sweeping aside Railways 3-0 in the 68th National Championships for the Santosh Trophy here at the floodlit Kanchenjunga Stadium on Sunday evening. A brace from Zico Zoremsanga either side of half-time and a second half injury-time strike from F. Lalrinpuia capped a brilliant tournament for the Northeastern outfit who went from strength to strength as the competition progressed. 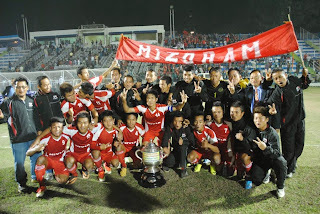 Courtesy their triumph, Mizoram bagged a purse of Rs. 500,000 (5 lakhs) while runners-up Railways got richer by 300,000 (3 lakhs). Railways, who had not won the Santosh Trophy since 1966, came closest in the 43th minute when Rajesh S's close-range header came off the crossbar. Present on the occasion were AIFF Senior Vice-President Subrata Dutta and Menla Ethenpa, the AIFF's Competitions Committee Chairman and Executive Committee Member. The match started at a good pace with both the outfits looking for an early goal. Railways earned three quick corners to keep the rival defence on their toes while at the other end their goalkeeper Ehtesham Ahmed - oozing confidence after his penalty heroics in the semifinals - spread his body wide to keep Lalnunmawia and Lalbiakhlua's shots at bay. With Railways missing their first choice centre-backs Vimal Kumar and Rajiv Boro due to suspension, Mizoram looked to take advantage but first-timers Akhil Rajbanshi and makeshift stopper-back Dipankar Das stood firm. David Larinmuana found Lalnumawia free on the left with a good-looking ball from midfield but the latter was well marked by Dipankar and right-back Y. Raju Singh. Lalbiakhlua then tried to be cheeky minutes after the half hour mark, trying to dink Ahmed from just outside the box on the right flank. But the hero of the previous night had his near-post covered with the attempt also landing onto the roof of the net. It was end to end stuff with the action mostly concentrated in the final third. The match's best chance fell to Railways when striker Rajesh S. hit the bar from close. Kisku tried his luck from the rebound but his effort was blocked. Moments later, Mizoram took the lead. F. Lalrinpuia crossed to Zico inside the box. The striker who has found the back of the net three times already in the tournament trapped the ball and swiveled past his marker to slot home into the far corner with the goalkeeper at full stretch. It was Mizoram who called the shots after the break. Three minutes into the half, Lalrinpuia unleashed a powerful left-footer which was fisted-out by Ahmed but only as far as Lalnunmawia who side-netted his close range effort off the rebound. But the red shirts who have been the flavour of the 68th Santosh Trophy did not have to wait for long to double their advantage and take a giant stride towards their maiden title. Zico was in the thick of things again as Mizoram broke on the counter. Lalbiakhlua teed up the goalscorer who did exceptionally well to round the goalkeeper and shoot into an empty net. The second goal deflated Railways' spirit and the three-time champions looked to have thrown in the towel with their high-flying counterparts dominating possession. F. Lalrinpuia pinched their opponents' emotion at the death with a third goal from close in injury-time to complete a memorable victory for Mizoram.